The black Point Source Audio Series8 CO-8WL Omnidirectional Waterproof Lavalier Microphone (Beyerdynamic) is a miniature mic designed to deliver a natural vocal sound for recording and live sound reinforcement applications such as concerts, musical theater, interviews, public speaking, and more. 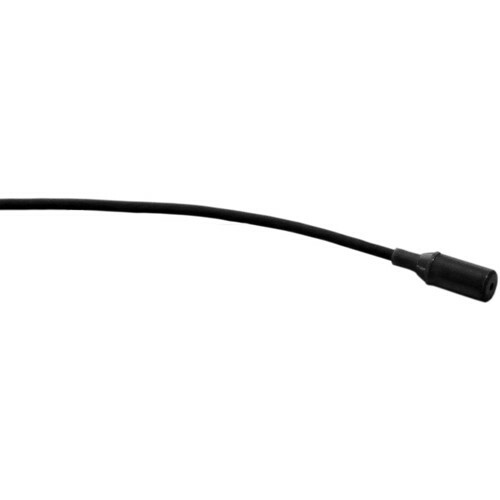 Featuring an unobtrusive mic element only 4mm in diameter, it can easily fit behind a button of the performer's clothing or be hidden in a hairline. The Series8 CO-8WL's omnidirectional polar pattern allows for a variety of mic placement options as it picks up the voice from all directions equally and doesn't need to be lined up with the mouth. The mic offers an IP57 rating, which protects it against water, sweat, and makeup, commonly harmful to microphones. The unit comes with a windscreen, cable clip, storage box, and an interchangeable TA4F/mini XLR X-Connector for Beyerdynamic wireless systems.